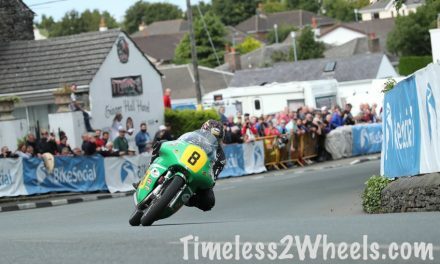 A motorcycle is considered a classic once it is over 30 years old. 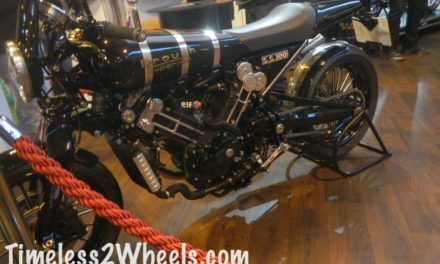 As the majority of retro motorcycles take their styling from the 1970’s and 80’s the following classic motorcycles are from around that era. 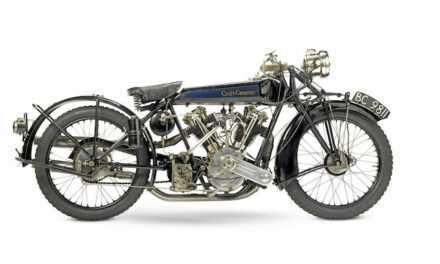 What is the best classic motorcycle to buy? Here are five of the best classic motorcycles to purchase and ride that should also make for a good investment. As someone who rode a KH250 until I got my full licence in 1981, the Kawasaki Z650 was the motorcycle I went to sleep dreaming of owning. The Z650’s I remember from my youth usually had an aftermarket cafe racer style seat on. These seats had 2 dice on the leather cowl (or was it a domino?) with the numbers 2 and 4 if I remember correctly. If I don’t and you do, please correct me in the comments as I can’t find anything online about them. 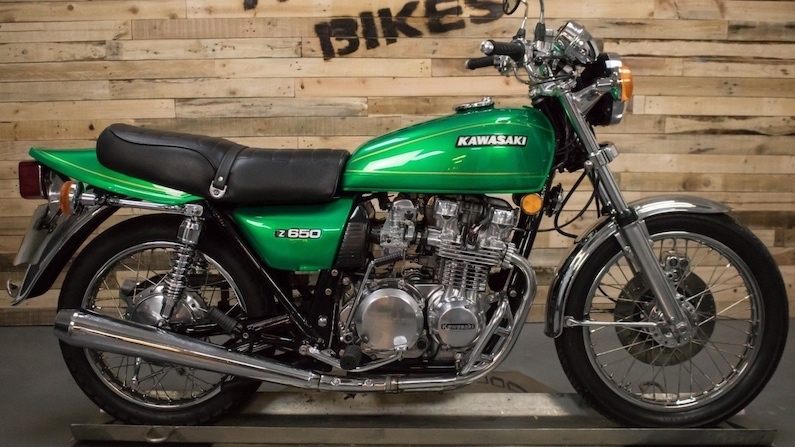 What makes the Kawasaki Z650 a great classic motorcycle purchase? Did you not see the photo above? The Z650 was and still is a real head turner. As well as looking fantastic, it shifts too. As a group of 17 year old 250cc riders we would be sat in the Blue Star cafe on the A1 at Blyth nursing our cans of coke until some of the older riders with their CB750’s, Suzuki GS750’s and Z650’s would pull in and then we would be out the door and all over them before they had their helmets off. “What can you get out of it then?” About 125mph was the standard answer. “Can the Honda keep up with you?” A laugh was the usual answer to that one. The GS750 was about the only comparable motorcycle that could live with the speed of the Kawasaki but it did have the bigger engine. The beauty in the photograph at the top of the page is the much sort after Z650B model in Green and is currently up for sale at £6495 at ‘Not Your Average Bike‘ in Ossett, West Yorkshire. It is a classic show winning motorcycle that has had a complete nut and bolt (including engine) restoration. The double overhead cam 900cc engine powering the Z1 produced 82bhp and was capable of 135mph. It was the acceleration though that made the Z1 an instant hit. It was so fast off the line (for a 70’s motorcycle) that the tyres and chains of the day couldn’t cope and the Z1 would eat them up and spit them out onto the tarmac. What Makes The Kawasaki Z1 a great classic motorcycle purchase? The Z1 was Kawasaki’s answer to Honda’s CB750 and when it appeared in 1972 it completely blew the Honda away. It was the most powerful Japanese 4 stroke ever and won just about every award going that year. While the Z1 is the only classic featured here that costs more than it’s current retro option there were less than 5000 of the original Z1 900’s made. According to expert Paul Jayson (see above video) only around 25% of those have survived so you are guaranteed buying a Kawasaki Z1 is a great investment should you be able to get your hands on one. The 1969 first editions, so called the K0 and also the sandcast are as rare as hens teeth. When one does come available it comes with a hefty price tag. Problems with the sand cast engines meant many had their engines swapped under warranty so frame and engine numbers don’t match up. These early models were shipped to America and the UK had to wait for the K1 model released in 1970. The K2 followed a year later and it was these 2 models that were the CB750’s best sellers and probably your best option as a classic motorcycle to buy for riding. Unlike the later editions the K1 and K2 maintain the originals fine looks but with a few improvements. What makes the Honda CB750 K1 and K2 a great classic motorcycle purchase? The Honda CB750 has been called a game changer and the first Japanese super-bike, both would be correct. It definitely changed both Honda and Kawasaki. Kawasaki had been working on a new 750cc 4 cylinder game changer of their own and Honda realised they could beat them to the market place by 3 weeks if they sand (gravity) cast their engine casings. They did and so Kawasaki scrapped their own 750 super-bike and went back to the drawing board. 3 years later they unveiled the Z1 900. The CB750 was in production for 10 years and over 400,000 were sold worldwide – Almost half of those sales came in the first few years with the K0, K1 and K2 models. While the numbers sold means there are still plenty around, the later models (cheaper) are popular with the custom builders. In particular, those looking to build a Cafe Racer thanks to that glorious 4 cylinder engine sound and Honda’s famous reliability. The Katana is the result of Suzuki wanting something ‘different’ from the Universal Japanese Motorcycles of the day – the big 4 cylinder motorcycles such as those featured above. If that was the intention then they succeeded. I remember seeing it for the first time and not liking it one bit. I just couldn’t understand why one of my pals thought its futuristic looks were amazing. What makes the Suzuki GSX1100s a great classic motorcycle purchase? The Katana has taken on a bit of a cult status and the value is definitely on the up. If you are one of those that drooled over the Katana, now rather than later would be the time to take the plunge. A new Katana is out this year which will more than likely bring even more interest in the original version. I owned an XT500 in the mid 1980’s and they are bags of fun. They handle fine on the road but unlike their modern counterparts going off road is no problem with an XT500. In fact, the XT500 won the first 2 Paris-Dakar rallies and the 1977 500cc Motocross world championship – Try that on a Ducati Desert Sled! Just about every duel purpose designed motorcycle built since the XT500 came on the scene has paid homage to it. And why not, it looks fantastic, it’s simple, uncomplicated and practically bullet proof. What makes the Yamaha XT500 a great classic motorcycle purchase? If you like the Scrambler looks then the Yamaha XT500 should be on your shortlist. For half the price of a new Ducati or Triumph Scrambler you get to own and ride the original genuine dual purpose motorcycle. And when it comes time to sell it on you’ll get more than you paid for it. Take a look at the excellent video above for more details on this fantastic motorcycle. I could have included any number of classic motorcycles from the 70’s and 80’s but I went with 4 that I’ve always had a soft spot for. I included the Katana because prices are on the rise faster than most so it makes an ideal classic motorcycle purchase if you were one of those that loved its looks. Which classic motorcycle from the 70’s and 80’s would you buy if you had room in the shed? Or do you already own one? Please use the comments below to let us know. PreviousWhich Is The Best Cafe Racer For Big Guys? NextWhich Cafe Racer Is Best For A Beginner?